TAMPA — A 23-year-old driver faces charges after police said he engaged in an illegal street race Wednesday that left himself and another driver injured. Michael Heiman faces charges of racing on public streets, aggravated careless driving and driving with a suspended license and was also issued several traffic citations. The incident took place at about 11 a.m. in the 11300 block of N Florida Ave. Witnesses said they saw Heiman’s blue 2012 Dodge Challenger speeding south on Florida Avenue while racing a white Challenger. Both exceeded the posted speed limit, police said. Heiman’s car switched from the inside to the outside lane to avoid stopped traffic, police said. But then he spun out of control and slid into the northbound lanes and oncoming traffic, police said. The blue Challenger struck a black 2005 black Buick sedan. Heiman and the other driver were both taken to Florida Hospital Tampa for treatment of what was described as "severe but non-life threatening injuries." Police are still searching for the white Challenger and looking to identify the driver. They may also have a partial tag number for that car. LAS VEGAS - A woman is dead and a man critically injured after being struck by a suspected drunk driver just outside the Hard Rock Hotel early Sunday morning. Police responded to the collision just before 1 a.m. near Harmon Avenue and Paradise Road. Captain Nick Farese with the Las Vegas Metropolitan Police Department told 8 News Now that the victims were walking on the sidewalk when the suspect struck them with his Dodge Challenger. "Our pedestrians were doing exactly what we're asking them to do -- walking on the sidewalk. They weren't jaywalking; they weren't in the roadway. They were walking on the sidewalk and because of somebody choosing to drink and get behind the vehicle, now we have somebody who lost their life and we have somebody who was hurt," Farese said. According to Metro Police, the suspect fled the scene after striking the pedestrians. NHP troopers were able to track down his vehicle thanks to descriptions provided by witnesses at the scene, they said. The suspect was arrested and charged with felony DUI. Metro Police said a female passenger was in the vehicle with the suspect and is cooperating with the investigation. Three pedestrians were struck and killed when a car veered out of control in Bloomington Sunday night. Police say a Dodge Challenger was heading eastbound on Slover Avenue around 8:35 p.m. when the driver lost control and the car left the roadway, crashing into four pedestrians on the sidewalk and then striking the wall of a building. Three of the pedestrians died at the scene and the fourth was transported to a local hospital. The California Highway Patrol is investigating the cause of the collision. MOORESVILLE, NC — Iredell County Sheriff's Office is investigating a Monday morning robbery of the Food Lion grocery store on Williamson Road by two suspects claiming to have a gun, according to a local report. The suspects in the robbery were two black males, one of whom was wearing a black and white shirt, Iredell County Sheriff Darren Campbell told WSIC July 16. The pair demanded cash, which they put in a plastic bag, according to the report, which noted that "it is unclear if a firearm was actually displayed during the robbery." They fled the scene in a grey Dodge Challenger with a silver gas cap. CENTRAL CITY, Ky. (7/16/18) — A 30-year-old Nashville, Tennessee man led police on a chase from Wendy’s Restaurant parking lot in Central City along a portion of U.S. 431 shortly before 6 p.m. Thursday. Central City Police Department said Patrolman Chris Cummings responded to the Wendy’s parking lot on South Second Street to the report of a suspicious person. When he arrived, Cummings spoke with Darin Wilson, who was driving a 2016 Dodge Challenger in the parking lot. After Cummings asked for Wilson’s operator’s license, Wilson fled south on South Second Street and onto U.S. 431 South toward Drakesboro with Cummings in pursuit. CCPD said because Wilson had several near collisions with other vehicles, Cummings cancelled his pursuit for safety precautions. A short time later, Wilson’s vehicle was stopped when Logan County Sheriff’s Department deployed spike strips in Logan County. Wilson was charged by LCSO and taken to jail. Wilson was charged on Muhlenberg County warrants for first-degree fleeing and evading police/motor vehicle, two counts of first-degree wanton endangerment/police officer, four counts of first-degree wanton endangerment, reckless driving, speeding more than 26 MPH over the limit, disregarding a traffic control device and driving on a DUI suspended license. Wilson is being held in the Logan County Detention Center, where he faces other charges by LCSO. NBC Los Angeles reports on a suspected DUI crash that resulted in the death of a woman in a multi-vehicle pile-up. 22-year-old Irving Aguilar-Calixto was driving a souped-up Dodge Challenger in excess of 100 m.p.h. at about 1:30 a.m. on Thursday. He drove southbound down the 5 Freeway. Near the Alton Parkway exit, Aguilar-Calixto crashed into a Prius being driven by an Uber driver. The driver was on the clock but did not have passengers at the time of the crash. Ten minutes after the crash, another crash occurred, which ignited a chain-reaction pileup that involved seven other vehicles. In total, nine vehicles were caught up in the crash. Victims included children aged 11, 10, and six months of age. In the lead vehicle in the second crash was 25-year-old Maria Osuna. After the crash, she undid her seatbelt to turn around and check on her 6-month-old child in the back seat. When another vehicle slammed into her own, she died of her injuries. Eight people, including the three children, were taken to trauma centers for injury treatment. Everyone convicted of DUI in California faces penalties that can include fees, license suspension, and jail time. However, California also has additional “enhancements” for DUI charges that can make the penalties for a DUI more severe. Some enhancements include DUI with excessive blood-alcohol levels, DUI with excessive speeding, hit and run DUI, DUI causing injury or death, underage DUI, child endangerment DUI, and DUI combined with refusing a chemical test. Any one of these can enhance a DUI charge and can increase the potential penalties a person may face. not mopar crime, but crime. MANGHAM, La. - (10/15/18) A Baton Rouge couple is behind bars after Mangham police find 10,000 ecstasy pills during a traffic stop. Police say that a blue Dodge Challenger was traveling nearly 60 MPH in a 45 MPH zone on Highway 425 south in Mangham. Once the vehicle was pulled over, officers say the driver Clark West appeared extremely nervous when asked where he was traveling to. When officers asked to search the vehicle, West denied the request and a canine unit was called. While waiting on the canine unit, the passenger, Quienetha A. Williams, admitted to police that she had a 9mm handgun that she owned. After the canine officer signaled, a search of the vehicle resulted in officers finding a black bag with more than 10,000 suspected Ecstasy pills that were packaged into 13 individual bags. West and Williams were placed under arrest and taken to the Mangham Jail. A man from Kansas, Oklahoma, is facing six charges in Payne County District Court after he led sheriff's deputies on a high-speed chase and reportedly drove toward patrol vehicles, hitting them with his Dodge Challenger on Nov. 16. Colbe Lee Pack, 29, is being held on $4,000 bond in Payne County Jail and is scheduled to appear with legal counsel Dec. 18. Pack was charged with attempting to elude, two counts of running a roadblock, two counts of assault with a dangerous weapon and possession of a controlled drug and faces up to 10 years in prison on each assault charge if convicted. Pack led deputies with the Payne County Sheriff's Office on the chase before 10 a.m. Nov. 16 after two deputies were dispatched to Bridgeport Apartments in west Stillwater seeking another person who had a felony arrest warrant in Payne County, according to the affidavit. The manager of the complex called dispatch and said the suspect was driving a red Dodge Charger, which had gone across the street to Walmart at 4545 W. 6th Ave. Deputies left the area only to receive another call from management the Charger had returned, and one deputy advised the vehicle was a red Challenger. The affidavit reads Pack and a passenger were seated in front of an apartment and told deputies they had dropped the suspect off at a U-Haul dealership nearby and went to Walmart on their own. One deputy got Pack and the passenger's information to run through dispatch, while another deputy began to leave the complex to search for the original suspect. 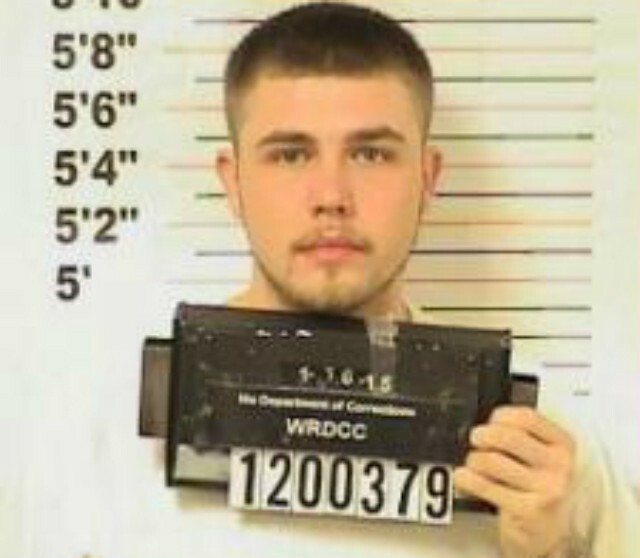 "I only got a few hundred feed down the road when our dispatch told Deputy Henninger that Colbe had a suspended license and a felony warrant out of Delaware County and he was entered in the National Crime Information Center as a wanted person," Deputy Brandon Myers writes in the affidavit. Myers turned around to assist Henninger in the arrest, when he noticed Pack start the car, "revving the motor up" and put the car in drive, jump a curb "at a high rate of speed through the yard of the apartments and between a metal fence." The two PCSO patrol units began the pursuit, going west on Sixth Avenue to Country Club Road and pursuing the Challenger south to 80th Street. Pack reportedly hit speeds in excess of 85 mph between Sixth and 19th avenues, and "went through the stop sign at 44th (Ave.) and Country Club at over 105 mph." The pursuit went east at 80th Street toward Western Road, where PCSO deputies had set up a road block with two patrol vehicles – but Pack reportedly went through the intersection without hesitation and continued east toward Washington Street. An unmarked Stillwater Police unit, housing two detectives and a K-9 unit, sat with its emergency lights activated and one detective reporedly deployed stop sticks. "The suspect hit his brakes and then turned toward his (SPD detective) patrol car, even making eye contact with him, striking his patrol car," the affidavit alleges. The Challenger's collision with the parked vehicle caused both detectives to jump out of the way, sending the SPD unit toward one of the detectives after it was hit, and the Challenger came to a rest more than 100 yards east of the collision. Pack was apprehended after reportedly leaving his car and passenger behind, running north on foot before a PCSO deputy tackled him and placed him into custody. Four juveniles turned a Houston area CarMax parking lot into their own demolition derby, causing $800,000 in damages. They gained access to the dealership's keys, broke into various vehicles and crashed them into over 20 cars causing a multitude of damage. The juveniles then proceeded to make their own version of 'bumper cars,' smashing up over 20 vehicles. "All four juveniles were arrested and booked into the Harris County Juvenile Detention Center, charged with 1st Degree Felony Criminal Mischief,” said Constable Mark Herman in an update posted on Facebook Monday morning. LITTLE ROCK, Ark. - Police are searching for suspect(s) after a Friday night shooting at Park Plaza Mall. Little Rock Police were called to Park Plaza Mall just after 8:30 p.m. in regards to a shooting. Officers at the scene found an abandoned 2018 black Dodge Challenger with the passenger door ajar. According to the police report, the passenger side window was shot out with several bullet holes throughout the vehicle. Police found a large amount of shell casings in the surrounding area of the car, the incident report states. Officers did locate a trail of blood leading west from the vehicle towards a stairwell, but could not find the victim. The Dodge Challenger was towed and stored as evidence. A witness told officers he was driving in the parking deck when he heard gun shots and noticed a male running from the scene. According to the report, the witness said he tried to duck down and swerve away from the shots when the male running ran into the passenger side of his vehicle, causing minor damage before continuing to flee. If you have any information regarding the incident you are asked to call Little Rock Police. Metro Police announced Tuesday that two felons were arrested following a two-month heroin distribution investigation. Ramell Webster, 34, and Caddias, 42, of Murfreesboro, were arrested after undercover detectives executed a search warrant at Webster's home on Douglas Avenue. Police found a half-pound of heroin, five guns, ammunition, and $2,600 in cash. They also found a hydraulic press that it used to compress heroin into brick form, according to police. Officials also seized Webster's Cadillac. They believe he purchased it using money form selling drugs. When police arrived, they found House holding nearly 1,000 Xanax pills. Because of this, Metro Police and the Rutherford County Sheriff's Office searched House's Murfreesboro home. They found 2,500 Xanax pills and $8,000 cash. they also seized his Dodge Challenger. Webster faces multiple gun and heroin charges. His bond is set at $151,500. House, facing charges for his Xanax possession, has a bond set at $10,000. Do you know how I know you are stupid? ATLANTA - Calvin Ridley had his car stolen at a gas station in Buckhead on Saturday night, police confirmed to The Atlanta Journal-Constitution. The Falcons rookie wide receiver was at a BP station when he went inside the store with his 2018 Dodge Challenger still running, said Atlanta police spokeswoman Officer Stephanie Brown. THOMPSON - A Massachusetts man is facing charges after police said he drove the wrong way on Interstate 395 in Thompson in a 2018 Dodge Challenger Monday night, while under the influence of alcohol. At 9 p.m., Troop D said they received a 911 call reporting a possible wrong-way driver traveling north in the southbound portion of I-395. According to state police, troopers “saturated the area,” looking for the vehicle. Police said they received information that the motorist had corrected itself and was driving the correct way, however, traveling at varying speeds and unable to maintain a lane. Alvarenga failed standardized field sobriety tests, police said, and admitted to consuming alcoholic beverages at Mario’s Show Place in Webster. He was charged with operating under the influence of alcohol/drugs, failure to drive in a proper lane, driving the wrong-way on a limited access highway, illegal entry onto a limited access highway, conducting an improper u-turn and use of an improper signal. LIVINGSTON COUNTY, KY — The Livingston County Sheriff’s Office says a man was taken to a local hospital after his vehicle flipped during a high-speed chase. Investigators say the man nearly hit several vehicles during the chase, including a police cruiser. In a news release, Sgt. Jason Kirk says he was driving south on Kentucky 453 around 3:45 p.m. Thursday when he saw a 2009 Dodge Challenger speeding north on KY 93 near the intersection with KY 453. Kirk says he saw the car nearly hit another southbound vehicle. He says as the car continued northbound, it drifted into the southbound lane — where it nearly hit a police cruiser. Kirk says he turned around, turned on his lights and sirens, and tried to pull the car over. The Challenger did not stop, and it nearly hit another vehicle as it continued down the road near Friendship Baptist Church. The sergeant says the Challenger tried to turn onto Heater Store Road, but the car was going to fast, so it flipped twice before landing on the driver’s side on the northbound shoulder of the road. That’s when Kirk says the driver — 43-year-old Jeffrey Lynn Collier of Paducah — got out through the passenger’s side window and took off running through the woods near the road. Kirk says he ran after Collier and apprehended him about 75 yards away from where the car crashed. Kirk says Collier was taken to Lourdes Hospital in Paducah for possible injuries. Collier is charged with one count of first degree wanton endangerment of a police officer, three counts of first degree wanton endangerment, one count of first degree fleeing or evading police in a vehicle, one count of first degree fleeing or evading police on foot, a count of speeding 26 mph or greater over the limit, driving under the influence on the first offense and failure to wear a seat belt. On Wednesday, a suspect was arrested during a traffic stop by Decatur police near the intersection of Church Street NE and 6th Avenue NE. Upon contact with the driver, Curtis Garth, police say an officer observed a strong odor of marijuana coming from inside the car. During a search of the vehicle, officers found more than 28 grams of cocaine, MDMA, marijuana, drug paraphernalia, brass knuckles and cash. Garth was arrested and taken to the Morgan County Jail with a bond set at $7,200. He was charged with trafficking cocaine, unlawful possession of a controlled substance (ecstasy), possession of marijuana second-degree, possession of drug paraphernalia, carrying a concealed weapon (brass knuckles) and no plainly visible tag. Garth's car, a 2016 Dodge Challenger, and the cash were seized by the Decatur police pending condemnation proceedings. The suspect's booking photo is not available at this time. No doubt almost anyone who uses taxis, Uber, or Lyft has, upon occasion, wished their driver would just speed up a little. Apparently, we all just needed to wait until Lyft driver Michael Cranford Jr. of Charlotte, North Carolina picked us up. According to authorities, Cranford hit speeds of more than 120 miles per hour while driving a passenger in Union County, N.C. on Saturday night—and didn't even slow down after blowing past a cop. Better yet for the Internet—albeit worse for the Lyft driver—the high-speed blast was caught on video. "I just heard his engine rev up and then, that's when I pulled out my camera," the passenger, who wanted to stay anonymous, said to WSOC-TV. According to the rider's account, the Lyft trip started out innocuously enough, with he and Crawford chatting about the driver's Dodge Charger SRT. (Based upon the video footage of the instrument panel, we at the Drive are guessing it was a pre-facelift LD-generation SRT8, but if any eagle-eyed readers can offer a correction, please do.) The driver then began showing off what the V-8-powered sedan was capable of, blasting well above the area's 55-mph speed limit. Then Cranford's Charger blasted past a North Carolina Highway Patrol car. "[Crawford] said, ‘There's a blue light. I'm going to jail. I've got to go,’" the passenger said. According to the pursuing trooper, Crawford's Charger proceeded to bob and weave through traffic, going so far as to pass on a double-yellow line. The officer said he tried to keep up with the Hemi-powered sport sedan, but couldn't. Crawford apparently didn't know that, however, because according to the passenger, the Lyft driver ducked behind a house and doused the lights. "He straight up told me, ‘You're going to Charlotte with me,’" the passenger said. Said passenger wasn't having any of that, however. He reportedly told the driver to drop him off at a gas station, at which point he called the police. Authorities were quickly able to track down Crawford, who was charged with speeding and reckless driving. Court records checked by WSOC-TV revealed the Dodge driver had a history of moving violations, having been pulled over at least thrice for speeding; however, all those prior infractions were reduced. Not surprisingly, since receiving word of the incident, Lyft has reportedly deactivated Cranford's account. ATLANTA - Police are now investigating whether a deadly shooting outside a southwest Atlanta apartment complex was possibly gang-related. Atlanta police said they found a 15-year-old shot in the passenger seat of a stolen Dodge Charger off Mount Zion Road in southwest Atlanta. Police have identified him as Jamari Holmes. Police said he died of a single gunshot wound to the head. Police confirmed to Channel 2's Lauren Pozen that Holmeas was a known gang member and was wearing an ankle monitor at the time of his death. The Columbia Police Department were searching for a man Tuesday who is wanted for kidnapping, simple assault and theft after beating a woman in her home and taking her iPhone. David Thomas Thorpe, 32, was visiting the home of a mutual friend on Nashville Highway when he began acting paranoid and accused the home’s resident of trying to set him up, according to a report released by the department. The report states that Thorpe then took the mobile phone of the resident, an iPhone S+ valued at $350 encased in a $10 case decorated with marijuana leaves, and demanded that she unlock the phone or he would not allow her to leave the room. Thorpe then hit the female resident five or six times before fleeing the property in a black Dodge Challenger decorated with a red racing stripe, the report stated. The resident, whose lip bled from punches allegedly thrown by Thorpe, told the police she screamed as him during the confrontation. The responding officer, John C. Shepard, reported that the department attempted to make contact with Thorpe at a residence he is known to frequent but were unsuccessful. The Columbia Police Department continues to search for Thorpe who is wanted on warrants of kidnapping, simple assault and theft under $1000. An archived mugshot of the suspect released by the department identifies the 32-year-old man as Caucasian, standing at 6 feet tall and weighing approximately 200 pounds. The released image also indicates Thorpe has a previous criminal record. MIAMI (CBSMiami) – Police have released new information on an armed robbery pursuit that started in Miami Beach and ended in Northwest Miami-Dade. Police say 34-year-old Terence Daniely led officers on a chase after he robbed a parking valet of $1500 in Miami Beach. Surveillance video shows Daniely taking off in a white Dodge Challenger. Officers saw the car soon after and started a pursuit. Police say at one point, Daniely shot at officers. The chase ended in Miami near Jackson Memorial Hospital when Daniely bailed out. After an hours long manhunt and negotiation, police took him into custody.